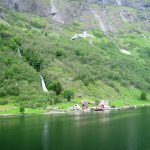 A cluster of red and white wooden buildings nest in a meadow at the edge of a lake that is really the long finger of a Norwegian fjord. The sheds and houses are dwarfed by the mountains looming above them, mountains thickly covered with the greenest trees I’ve ever seen. The beauty of the landscape opens like moist wings inside my chest, but despite the seduction of its verdure, I am haunted by a question that disturbs me: how do people survive in such isolation? What power do these mountains impose on those who live in their shadows? Had my ancestors been shaped by the immensity of this gigantic landscape? Prior to this trip, I had always regarded Norway with great ambivalence–this despite (or because of) the fact that I’m half Norwegian. My grandparents emigrated to the U.S. in 1870, settling in the Red River Valley of North Dakota where they ran a modest farm. My mother grew up Norwegian and spoke the language all her life–though not with her children. Norwegian was a secret tongue which she reserved for talking to her sisters about things she didn’t want us kids to know. Childlike at times, but, more often, distant, unsupportive, sometimes hardly there, my mother was what I associated with being Norwegian. The rest of my Nordic family also struck me, with some exceptions, as a quiet and overly sober bunch– except for Aunt Karina, who wore a lot of rouge and bright red lipstick and blouses that looked like they were made in the 1940s, Aunt Karina who played “Red River Valley” on a ukulele and sang “From this valley they say you are going” in a husky voice. It was because of a novel, read three years after my mother’s death, that I decided to risk confronting my Norwegian past and heritage. I’d often wondered if my mother’s remoteness was an inheritance of her culture, and after reading Per Petterson’s Out Stealing Horses, I decided it was. As the novel opens, the protagonist, Trond Sander, a widower in his sixties, has moved to a cabin in the woods near a lake. He lives there alone, glad to be in a place where there is “only silence.” Bit by bit he recalls his past and especially his relation to a father he adored but who was often absent, a father who finally abandoned the family altogether, taking part of his son’s life with him. Amidst the stillness of a forest, where you can hear the sound of ants crawling, Trond comes to terms with pain and loss, concluding that we “decide for ourselves when it will hurt.” I’d found in Petterson’s character a sense of injury and struggle with which I could identify. Trond finds a way of dealing with the ache of disconnection in the midst of the Norwegian woods. Perhaps I could do the same by going to Norway. Perhaps I could find a Norway of my own. On my first day in Norway I felt overwhelmed by the natural world. Bergen is a harbor city of 250,000, but the seven towering mountains to which it clings made the city feel like a village. Coming from cities in Southern and Northern California, I was used to distant, often golden, hills, but not to landscape that towered over the places in which I lived. Did mountains like those in Bergen contribute to “the law of Jante,” a fictional and quasi-mythical injunction to Norwegians (and other Scandinavians) to be humble, not to make too much of themselves? Without knowing the law’s name, I’d learned its lessons from my mother. Perhaps living at the foot of sky-jutting mountains in acres of meadow on a lake-like fjord— no roads in sight— also explains a certain fondness in Norway for self-reliance, a self-reliance that the country expects of its visitors as well. How else do you explain the paucity of signs directing you to historic sites, the terseness of information in museums, the failure clearly to indicate just how you get from train to bus to boat and then back to the train on Norway’s popular Nutshell Tour, a journey that whizzes you, without a guide, through lime-colored forests and meadows, past the breathless rush of waterfalls to the leaden blue of the fjords against snow topped mountains and then back again? Norway’s lack of signage reminded me of my self-reliant mother refusing to help me with those labor intensive “special projects” they assigned, and still assign, to kids in school. “I’ve always been a loner,” she said more than once to me. And now I’d come to the homeland of self-reliant loners. Not that Norwegians were unfriendly. If you asked them for directions, they were kind and glad to help. But as a rule, I felt the culture expected more of its visitors, more of me—a person who lacks a firm sense of direction, a person who refuses to drive in San Francisco because its hills are steep. On my second day I visited Bergen’s Art Museum and was struck by the work of Nikolai Astrup, an early twentieth-century Norwegian painter, who captures the overpowering presence of the landscape and, at the same time, shows how people living in it create their own comforting order in the form of gardens, fences, familial relationships, and interiors. In “Night Garden,” two small dark figures plant seeds in their carefully laid out plot against a backdrop of snowy peaks, dark meadows, and a huge yellow moon. I found many paintings with this theme. My favorite picture, however, was one of a bedroom in Astrup’s boyhood home. A canopied bed with a pillowy cherry-colored comforter takes up most of the middle space. In the background, a young girl stands in light at the top of a stair while off to the side the vast Norwegian landscape is reduced to a green and white dabbling only glimpsed through white curtains. As I contemplated that picture, I longed to have had a bed like that, longed to have possessed its comforts in my youth. I remembered my own childhood bedroom—attached to the garage, separated from the house by a shadowy backyard, a house in which my parents and younger brother slumbered peacefully, protected from startling noises in the night. I slept fitfully, dreaming constantly that someone was trying to break in. In the afternoon, as I walked down Bergen’s cobbled streets, I began to cry. I’d cried when my mother died because at that moment I had known for certain that I would never have a real mother. I cried on the cobblestones in Bergen because it occurred to me that I didn’t, and would never, have a connection to Norway that was an outgrowth of familial love. I would never be bound by family affection to the only country I could count as my motherland. Later in the trip, I visited the cultural wing of the Bergen museum. I was looking for information on the Vikings, bemused at the thought of being related to a people famed for swift boats and plunder, although I knew from reading that this wasn’t the whole story. Vikings farmed and fished and worked hard. They were fond of entertaining and found ingenious ways not to freeze to death in Norwegian winters. In a remote and poorly-lit section of the museum I came across life-sized models of people labeled ‘Sami.” They were wearing elaborately embroidered garb in red, yellow, and blue. Sami, I read, were the aboriginal inhabitants of Northern Norway, famously known for nature worship and a nomadic life involving tents and herding reindeer. Back at my rental apartment, I Googled “Sami” and the name of a nineteenth-century anthropologist, “Roland Bonaparte.” As the first of his black and white photographs flashed on my screen, the spitting image of my nephew in his youth looked back at me. I scrolled through the photographs and found, to my wonder, multiple versions of a distinctive family nose –a long one with a pronounced ski jump at the end. It was my nose, my mother’s, my grandmother’s, my nephew’s, and my own daughter’s. Since Sami live in snowy Northern Norway and my own ancestors come from the lush Valdres in the South, I was doubtful about there being a relation until I learned that an archeological dig has uncovered evidence of a Sami settlement in Valdres in the Middle Ages. So it is possible that my ancestors had Sami blood. Did I really come from a line of nature-loving pagans who valued community, worshipped rocks and trees, went in for drumming, relied on shamans to part the veil between the world of spirits and their own, and were given to wearing bright primary colors against the snow? Yes! As a child of the 1960s and as a person fond of intense color, I chose to think so. My religious mother would have been rejected this embrace of the Sami, much as other Norwegians had already done. Christian missionaries had tried, with some success, to convert the Sami in the 1600s and 1700s, and after World War II, the Norwegian State tried to make Sami conform to mainstream Norwegian culture. But in the 1960s and 1970s the Sami protested, finally winning the right to be represented in the Norwegian parliament and to teach their language again in schools. They also revived the Sami tradition of yoiking, a kind of singing chant that, depending on the context, may function as a form of self-reflection, of coming to terms with loss and pain, or of sharing memories, finding community, and recovering a sense that one belongs. Although my connection to the Sami might only exist in the Norwegian woods of my own imagination, I wanted to feel that I too had found community, a sense of belonging, a Norwegian past. And although these new found attachments did not bring me closer to my mother, they eased the pain. They made me feel, with Trond, that to some degree, we do decide “when it will hurt.” Perhaps, given the modesty of expectation required by the law of Jante, that was—and is—enough.